How will Panasonic's DVD-LS84 fare when spun up? 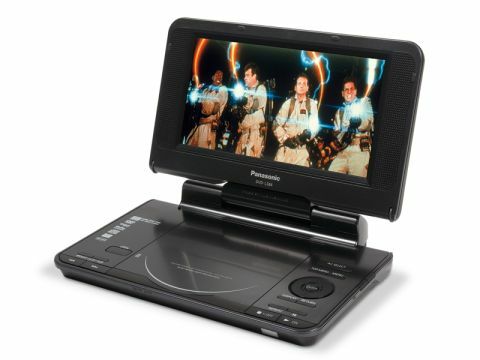 The Panasonic DVD-LS84 is equipped with an 8in widescreen, but thanks to the 'Free Style Viewing' feature, you can choose how to watch it. The screen unclips from the back support and slides forward onto the base, turning it into a tablet-style device, or you can opt for the traditional flip-top design. Either way, this slim, compact unit is comfortable to hold and pleasingly light, even with the battery pack attached. But its dull grey finish doesn't do it any favours. In the box are a plastic headrest bracket and cigarette outlet adaptor for in-car use (but, strangely, no remote), and the player is packed with useful picture and sound modes, plus Cinemascope and American Vista zoom modes. Format compatibility is excellent and the 7hr battery life is very good, although you have to reduce the screen brightness considerably to achieve it. Sadly, picture quality is blighted by the 480 x 234-pixel screen, which makes detail look soft and gives the image a chicken wire effect with jagged edges. Colour reproduction is also unnatural, lending skin tones a lobster-like hue. But blacks are deep, punchy and noise-free. As for audio, the built-in speakers unsurprisingly lack any punch, but through headphones you're in for a treat, particularly if you activate the headphone virtual surround mode. All in all not a bad effort, but lacklustre pictures and a lack of USB/SD card slots make other players better value for money.